Asthma quick-relief medicines work fast to control asthma symptoms. You take them when you are coughing, wheezing, having trouble breathing, or having an asthma attack. They are also called rescue drugs. These medicines are called "bronchodilators" because they open (dilate) and help relax the muscles of your airways (bronchi). You and your doctor can make a plan for the quick-relief drugs that work for you. This plan will include when you should take them and how much you should take. Plan ahead. Make sure you do not run out. Take enough with you when you travel. Short-acting beta-agonists are the most common quick-relief drugs for treating asthma attacks. They can be used just before exercising to help prevent asthma symptoms caused by exercise. They work by relaxing the muscles of your airways, and this lets you breathe better during an attack. 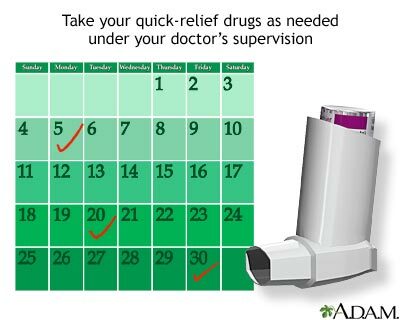 Tell your doctor if you are using quick-relief medicines twice a week or more to control your asthma symptoms. Your asthma may not be under control, and your doctor may need to change your dose of daily control drugs. Tremor (your hand or another part of your body may shake). Fast and irregular heartbeats. Call your doctor right away if you have this side effect. Your doctor might prescribe oral steroids when you have an asthma attack that is not going away. These are medicines that you take by mouth as pills, capsules, or liquids. Oral steroids are not quick-relief medicines but are often given for 7 to 14 days when your symptoms flare-up. Bergstrom J, Kurth SM, Bruhl E, et al. Institute for Clinical Systems Improvement website. Health Care Guideline: Diagnosis and Management of Asthma. 11th ed. www.icsi.org/wp-content/uploads/2019/01/Asthma.pdf. Updated December 2016. Accessed February 28, 2018. Asthma quick-relief drugs work fast to control asthma symptoms. You take them when you are coughing, wheezing, having trouble breathing, or having an asthma attack.